will be quite a bit to post over the next few weeks. 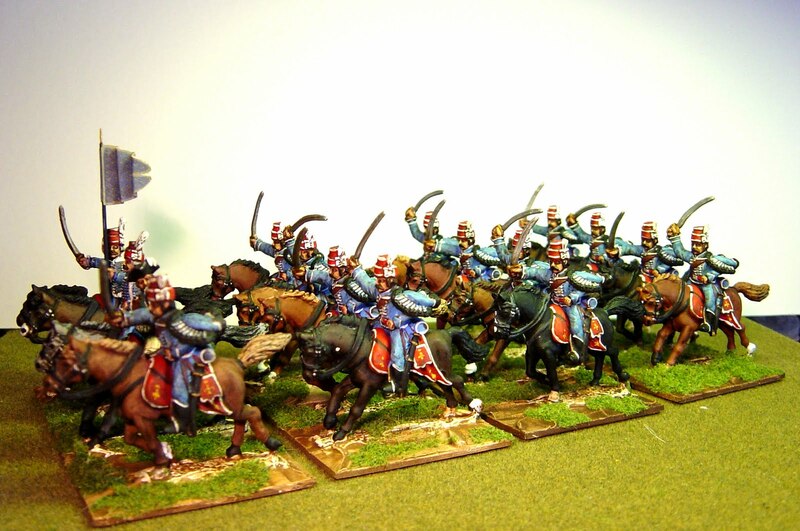 Meanwhile, here is a French SYW regiment of Hussars. The use of hussars was in its infancy in Western European nations and the French only had four regiments, mostly raised by Hungarian emigres. This regiment, Bercheny, was probably the best of them and one regiment, Polleresky's, was disbanded in 1758, (its squadrons hived off to other regiments) for doing what hussars do rather well - looting and pillaging. They sure look pretty but their quality leaves much to be desired. The figures are from Front Rank. The flag is conjectural. A beautiful looking unit!! I once painted these for a pal in 15mm. I liked them because of the light blue/grey coat, which is a little different to the usual red or blue. Stunning brushwork, Nigel! 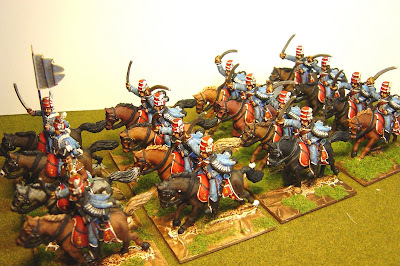 I never get enough of hussar regiments in miniature. Wow! That's a lovely looking unit. Great work. Great painting and basing wish I was to that standard but my painting days are over for the next few years until my daughter grows of age.